Barça Defeat Real Madrid 3-2 in Miami Clásico. 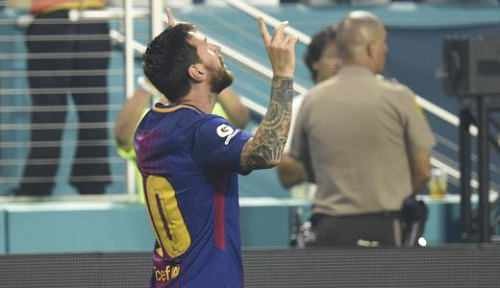 FC Barcelona’s return to Miami saw them defeat their arch rivals Real Madrid 3-2 at Hard Rock Stadium. Messi and Rakitic gave Barça an early 2-0 lead before Kovacic and Asensio tied things up in an exciting first half. Pique scored the game winner early in the second half and the packed house enjoyed a memorable friendly. These two sides will meet again for the Spanish Supercopa next month. Barça will now return home to host Chapecoense AF at the Camp Nou in the Trofeo Joan Gamper on August 7. FC Barcelona’s first match in Miami since 2011 saw them pitted against their arch rivals Real Madrid. This was the first time these two sides met in a friendly outside Spain since 1982. 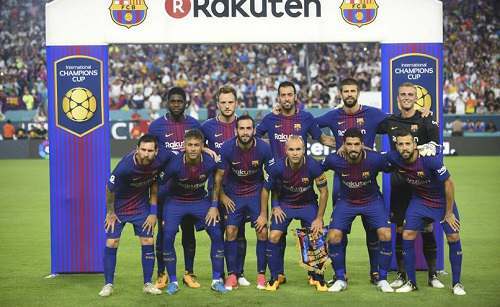 FC Barcelona fielded a strong starting eleven; Jasper Cillessen; Aleix Vidal, Gerard Piqué, Umtiti, Jordi Alba, Sergio Busquets, Rakitic, Iniesta, Luis Suárez, Messi and Neymar. It didn’t take long for the Blaugrana faithful to be celebrating after the game kicked off. After three minutes, Barça struck first. 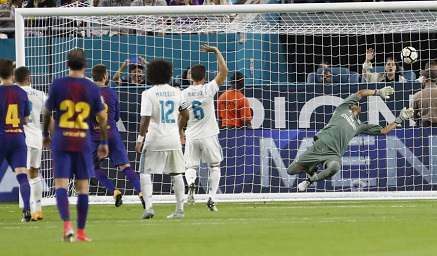 Messi opened the scored the scoring when he managed to magically ease himself inside the box before watching his shot deflect off Raphael Varane and the ball dip over Keylor Navas. In the 7th minute, Barça doubled their lead. 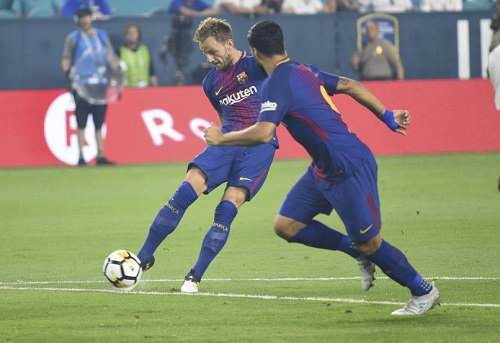 Neymar squared the ball for Suarez at the edge of the box, who dummied it, for Ivan Rakitic, and the midfielder blasted the ball past Navas and into the bottom left corner. Barça were completely in control while Madrid were still coming to grips as to what had happened. However, they exposed Barça’s backline when they pulled one back against the run of play thanks to Kovacic’s impressive dribbling before blasting the ball from 20 yards out and past Cillessen in the 14th minute. Barça could have doubled their lead again but squandered some great scoring chances. Those wasted chances would prove to be costly as Madrid managed to grab the equalizer in the 36th minute after a superb counter-attack from a corner kick with Asensio scoring the final goal of the first half. Barça captured the lead five minutes after the restart when Neymar’s free kick was met by Pique as he was able to volley from close range. Both sides then made numerous substitutions but both sides still had chances to score. 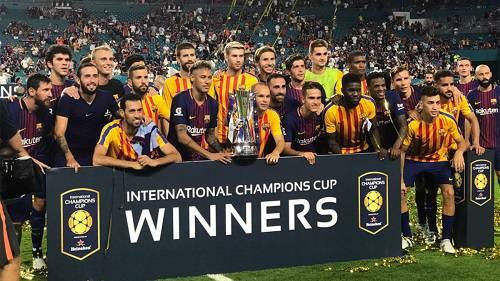 In the end, Barça hung on for a 3-2 win and earned the ICC North America tour trophy. Both sides will meet again for the Spanish Super Cup that will be held on August 13 and August 16. Barça will now fly back home and get ready for the annual Trofeo Joan Gamper match when they introduce the new team to the fans and host Chapecoense AF at the Camp Nou on August 7. FC Barcelona: Jasper Cillessen; Aleix Vidal (Semedo, 63′), Jordi Alba (Digne, 73′), Gerard Piqué (Mascherano, 73′), Umtiti (Vermaelen, 63′), Sergio Busquets (Samper, 73′), Rakitic (Aleñá, 73′), Iniesta (Sergi Roberto, 45′), Luis Suárez (Alcácer, 63′), Messi (Denis Suárez, 63′) & Neymar (Arda 73′). Goals: 0-1, Messi (Minute 3); 0-2, Rakitic (Minute 7); 1-2, Kovacic (Minute 14); 2-2, Asensio (Minute 36); 2-3, Piqué (Minute 50). Cautions: Varane, Carvajal, Suárez & Samper. Attendance: 66,014, Hard Rock Stadium (Miami). Previous PostErnesto Valverde is Barça’s new manager.